Visit the Admin Center Dashboard for an overview of participation rates within each of the TIM Tools. Users will see data for their school, zone, or the entire district depending on their administrative permission level. Panels two through six of the dashboard present participation rates for ARTI, TIM-LP, TIM-O, TIM-R, and the TUPS. The panels give an absolute number of participants and a participation percentage for each tool, along with a bar graph of the percentage. 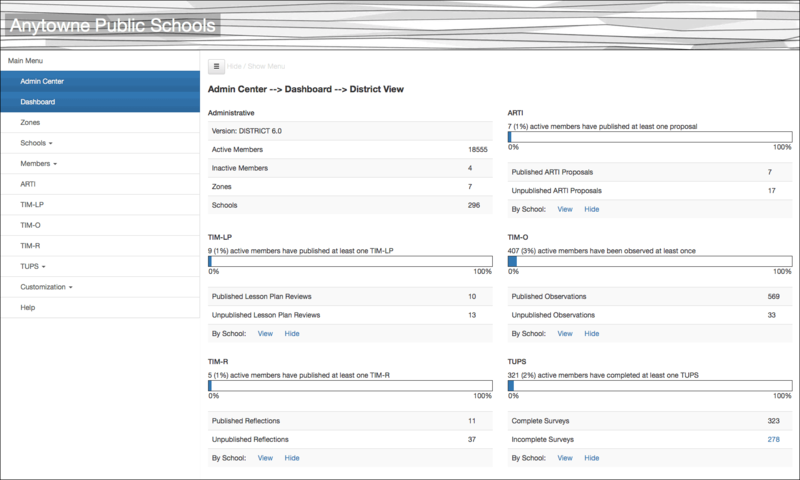 Members with district- or zone-level rights will see View and Hide options to display the data broken out by school. The Dashboard will be a good indicator of when it would be worthwhile to begin downloading spreadsheet data for each of the five tools.